A picture, taken in 1919, of Margaux Brown's collection. It was at that time being stored and displayed in the pantry of the Brown house. Also known as Dali's Clock for obvious reasons; it is actually a collection of clocks, rather than a single instrument. These were collected by Margaux Brown from a variety of sources (and corpses). They have no particular economic, spiritual or historical value but are presented in a single display case with all the relevant provinance (and some of the animals still attached) for no other purpose than good old-fashioned whimsy. Tigers, sharks and crocodiles devouring people and their watches are understandable everyday occurances and dimwitted goats swallowing clocks are not unimaginable scenarios. But can you explain the five foot long Moray Eel with the carriage clock in its stomach? And can the monkey rib-cage that is literally fused to the silver pocket watch be anything other than a fraudulent sideshow exhibit? The most interesting exhibits in this display case are arguably the x-ray pictures showing the Indian Railwaymans Timepiece inside an Elephant's skull and the alarm clock that Margaux brought from Mr. J. M. Barrie, which was made famous in the book that Mr. Barrie published in 1904 about delinquent children learning to fly. 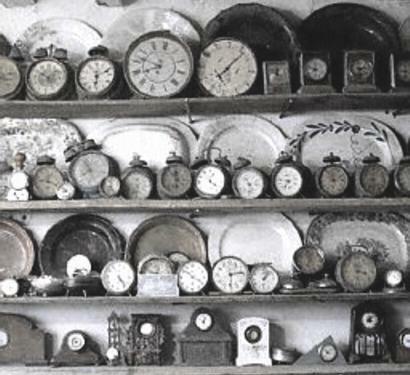 Seven sterling silver pocket watches, each of them the property of the absent-minded Sir Rupert Spencer, noted explorer and "time-tourist". Alike in appearance, closer inspection reveals that their similarity runs deeper than mere design. They each bear Spencer's scratched initials, the lettering so distinctive, and so identical on each, as to place it beyond doubt that they are in fact the very same watch. Discovered at various times throughout four centuries, in locales as familiar as Lincoln Park Zoo and as remote as a Delhi lake bed, all that distinguishes an individual watch from its fellows is the amount of wear and tear on each. From their increasingly scratched and dented condition one might place them in order, and thus construct a map of their owner's escapades, zig-zagging back and forth through time and space, an erratic journey which occasions the watch's multiple appearance in our current age. At some future point Sir Spencer will visit the House and claim the first watch in the sequence, its casing almost flawless. It will then be lost on the platform of Michigan Central Station in 1934, found and brought to the House later, becoming the second watch in the display. Sir Spencer will return once more to claim it, subsequently misplacing the piece during his jaunt to the Carpathian mountains in 1732. Again it will find its way back to the House sometime thereafter, thence becoming the third in the sequence. And so it goes, the watch's temporal trajectory looping sevenfold upon itself, Spencer returning to claim it each time until finally only a single piece will remain. The last in the display; its casing cracked and its face shattered, blood dried into its crevices, suggesting that its owner has an appointment with some frightful accident in the Bucharest salt mine where it was discovered.